2Dept. of Dental Technology, Federal University of Technology, Owerri, Imo State Nigeria. 3Dept. of Industrial Mathematics, Federal University of Technology, Owerri, Imo State Nigeria. 4Department of Material Science, Aveiro University, Portugal. results, hence depicting the usefulness of the model. 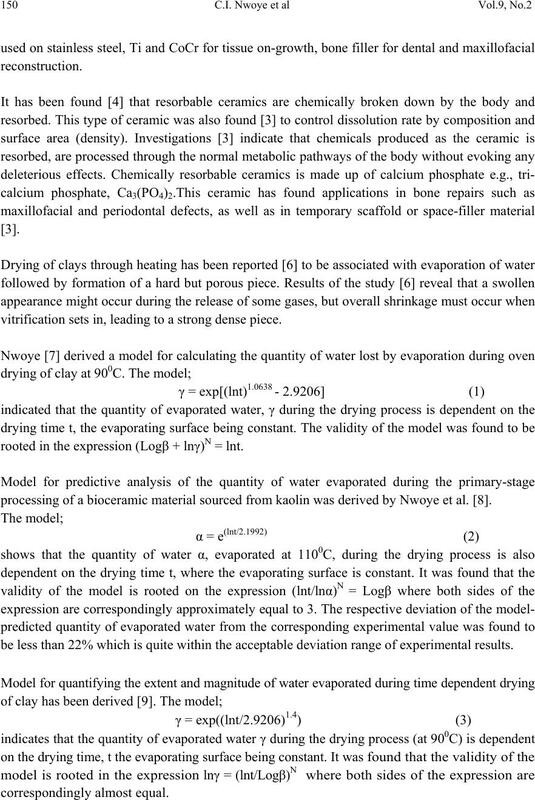 Keywords: Model, Water Evaporation, Processing, Bioceramic Material. Ceramics have been found  to comprise various kinds of non-metallic and inorganic materials. crystalline, amorphous, or glassy states. Bioceramics and associated biomedical devices are used in many parts of the human body. 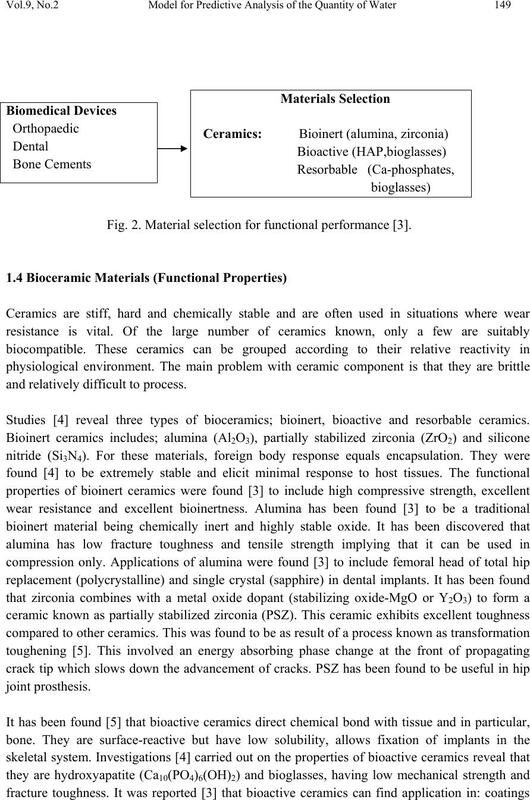 This concerns the effect of the physiological environment on the material (bioceramics)/device. movement, e.g. artificial knee joint; and space filling, e.g. cosmetic. the body and must not cause any adverse reactions within the host body. to be also dependent on mechanical environment: static, dynamic, stress, strain and friction. Fig. 1. 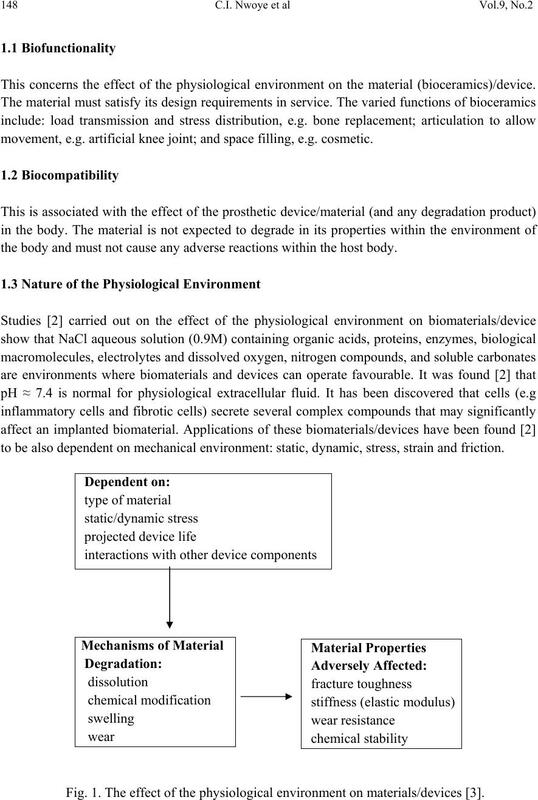 The effect of the physiological environment on materials/devices . Fig. 2. Material selection for functional performance . and relatively difficult to process. Studies  reveal three types of bioceramics; bioinert, bioactive and resorbable ceramics. vitrification sets in, leading to a strong dense piece. rooted in the expression (Logβ + lnγ)N = lnt. 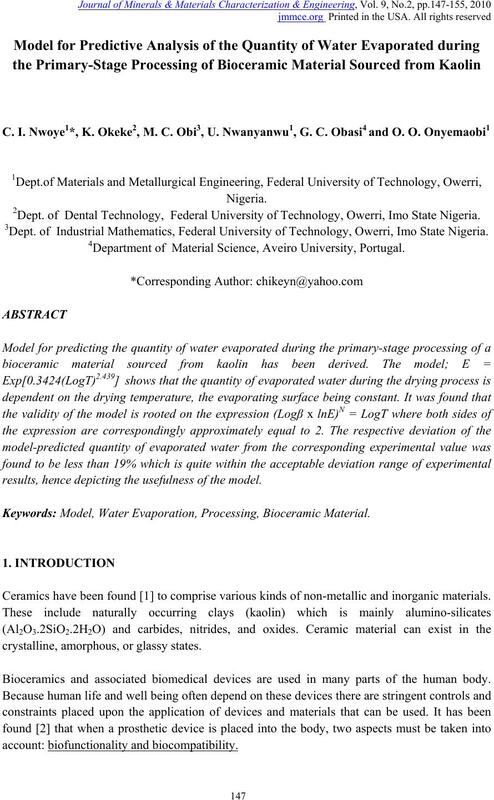 processing of a bioceramic material sourced from kaolin was derived by Nwoye et al. .
be less than 22% which is quite within the acceptable deviation range of experimental results. acceptable deviation range of experimental results, hence depicting the usefulness of the model. model-predicted results are 0.078 and 0.0502g/0C respectively, indicating proximate agreement. overall shrinkage must occur when verifications set in leading to a strong dense piece . engineering) as bioinert ceramics for total hip replacement. formulation are as shown in Table 1.
temperature range 80 -1100C) determined in the experiment . T = Drying temperature (0C). Table 1. 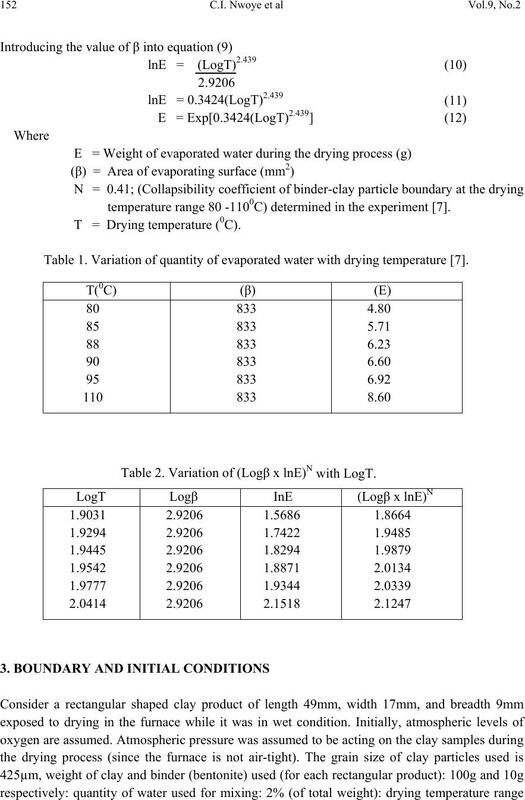 Variation of quantity of evaporated water with drying temperature . Table 2. Variation of (Logβ x lnE)N with LogT. other process conditions are detailed in the experimental technique . rectangular shaped clay products are taken to be symmetries. values and those from the experiment for equality or near equality. predicted E value to that of the corresponding experimental value (Table 3). 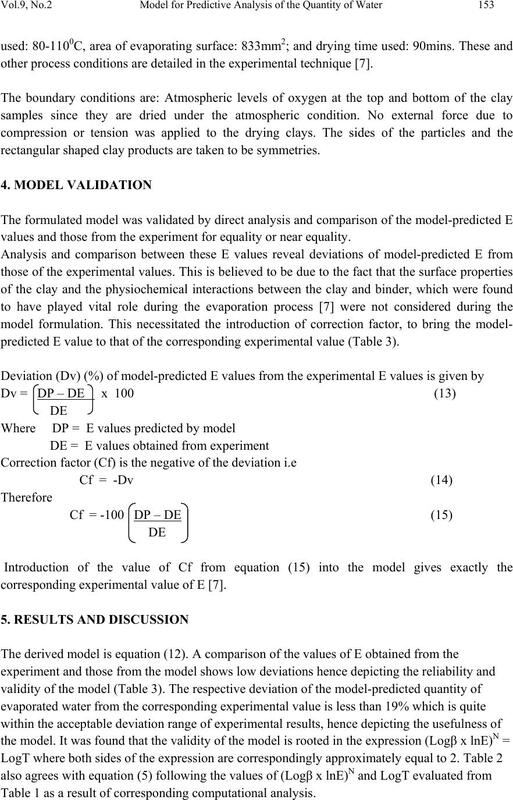 corresponding experimental value of E .
Table 1 as a result of corresponding computational analysis. EM = E values predicted by model. 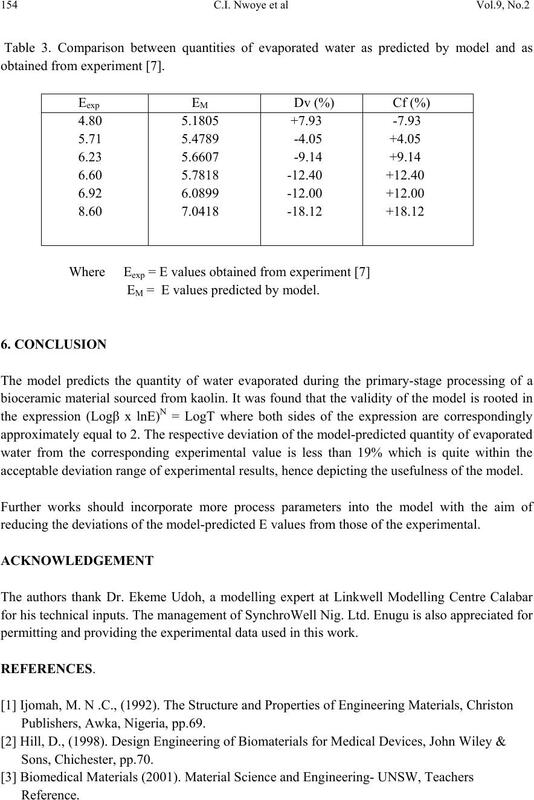 reducing the deviations of the model-predicted E values from those of the experimental. 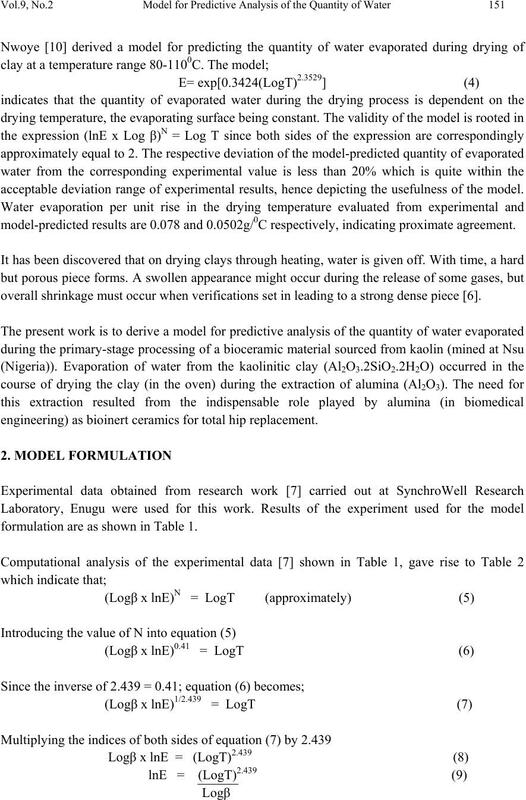 permitting and providing the experimental data used in this work. Singer, F. and Singer, S.S., (1963). Industrial Ceramics, University Press Cambridge, pp. 44.
during Oven Drying of Clay. Researcher Journal, 1(3): 8-13. Bioceramic Material Sourced from Kaolin. J. Nat. Sc., 7(4): 79-84. Drying of Clay. New York J. Sc. 2(3): 55-58. 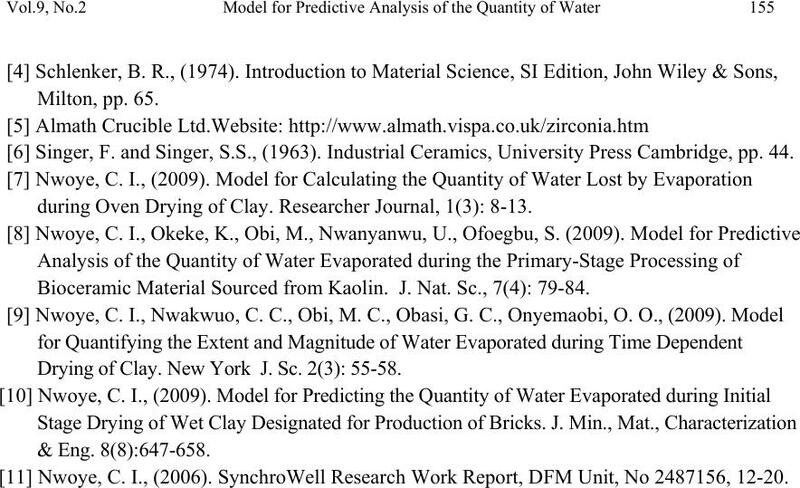 Nwoye, C. I., (2006). SynchroWell Research Work Report, DFM Unit, No 2487156, 12-20.